For those of you who are not hardened collectors or intense early music fans, it’s pretty much a given that within the main preservation and collecting-spheres, primary reverence is given to “pre-war” recordings. Particularly American blues, country, and jazz. The common thought being, roughly, that before WWII, music in America was more regional, localized, more raw, and recorded without much technical embellishment. It very often contained a natural feel that began to vanish after the Great Depression due to a number of contributing factors, such as the advent of radio, coupled with the vast amount of recordings available, and the dire economic straits of the record industry at that time. Thus, musicians could easily hear each other and change or adapt at a much faster rate, homogenizing music as a whole. These are big generalizations of course, covered in a lot of literature, and with all kinds of exceptions, but on some major levels it seems undeniable. Nowhere is this more apparent than in Sub-Saharan Africa. Prior to WWII, recording of Sub-Saharan music was sporadic, as I’ve outlined in various entries. Not only did it truly hit a stride much later compared with the rest of the world – in the late 1920s – but the recording of African music was stopped in its tracks a few short years after it began by the effects of the Depression. Once the industry recovered, the war began, and recording of Sub-Saharan African music halted again. When WWII was over, when the major European conglomerates, who almost exclusively controlled the world’s music industry, were picking up the pieces, independent competitor labels all over Sub-Saharan Africa began to appear, ushering in this new era. The result of this was an extraordinary amount of regional recordings from ca. 1947 onward. THIS was the golden age of recording for Sub-Saharan Africa, not the music of the “pre-war” era. The recordings from this period were, in fact, more varied than the African music recorded prior to the war. Perhaps even more varied than the America of the 1920s-30s. The comparison is admittedly unfair, but I bring it up just as an example, because the music recorded in Africa broadly ranged from deeply traditional, ceremonial and functional music nowhere near Western concepts of what music was supposed to be, to all manner of adept songsters and troubadours on various local or European instruments, to crystalline, harmonious pop, influenced by everything from Cuban rumbas to Bill Haley – yet, distinctly African. Within this post-WWII era came the guitar troubadours. Listened to today, one can’t help but compare their voices, picking styles, and melodies to American roots music guitar players from the late-20s and 30s – even musically there are often direct connections, as American country 78s were distributed in parts of Africa. Each guitarist had his/her own idiosyncrasies (and yes, there were women guitarists recorded), though they often fit into a particular regional style. I think it’s safe to say that the bulk of these players were from South Africa, Zimbabwe, Zambia, Kenya, and Congo, though there were plenty of solo guitarists from Mozambique, Tanzania, Uganda, and Malawi, as well. While the Congolese guitarist Jean Bosco Mwenda is undoubtedly the most well-known guitarist from this era, probably the second most influential was George Sibanda from Zimbabwe. Even his biography reads like legend – in that there is almost nothing to go on except his recordings, spread over about a decade on the Gallotone label, and the fact that he drank himself to death by the late-50s after achieving great celebrity and stardom from southern Africa to Kenya. 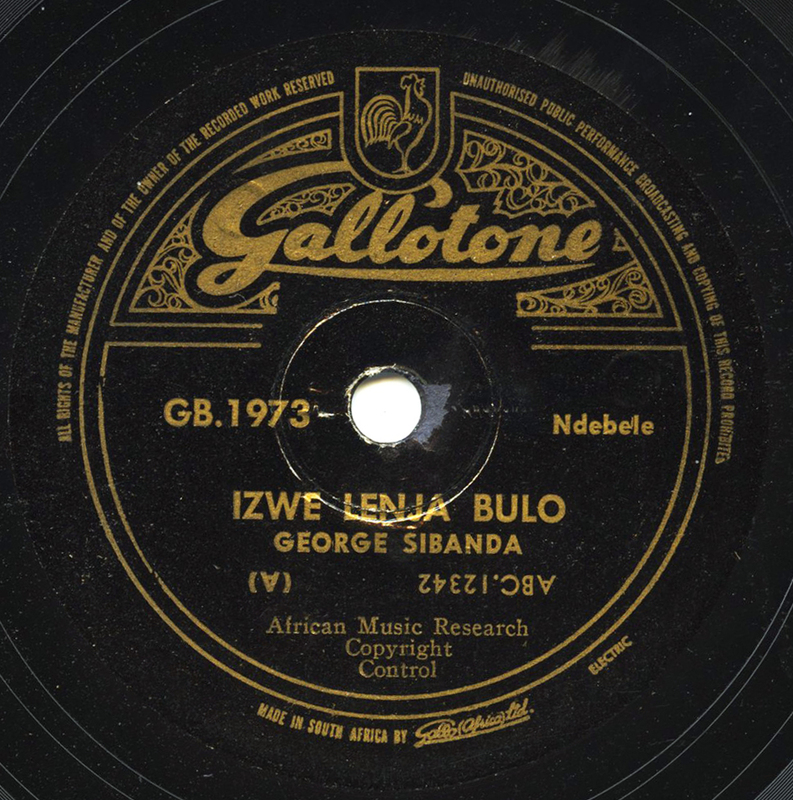 Sibanda was “discovered” by South African ethnomusicologist Hugh Tracey, who was working for the Gallotone label. Sibanda’s name spread outside of Africa after his death, as folk musicians like Jim Kweskin and Ramblin’ Jack Elliott took turns covering his tune “Guabi Guabi” in the 1960s. However, few had the chance to hear his recordings outside of Tracey’s LP reissues and the American cover versions, until SWP Records issued a terrific CD of a selection of his recordings. That CD is not complete, however, and a number of brilliant Sibanda tunes remain on elusive 78s. This is one of them. While Sibanda almost always was a straight-up guitar picker, this is a slide guitar piece, and is evocative – perhaps even a wholehearted copy – of American country music. If someone told you it was recorded in 1930, would you believe it? Would it make a difference in how you listen, or your opinion of its “value”? Sibanda recorded this in the 1950s, the equivalent of the “pre-war” era musically, in Africa.